Delivering wireless speeds of up to N150 Mbps**, the G54/N150 Wi-Fi Router provides a reliable Internet connection in your home. 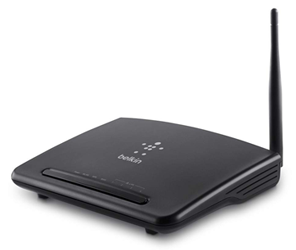 Ideal for surfing the Web or emailing, this router is twice as fast as G Technology*. All you need to get the G54/N150 Wi-Fi Router up and running is a smartphone, tablet, or computer. Simply open an Internet browser, enter the URL provided in the quick installation guide, and follow the onscreen instructions. And if you have any legacy devices that use Wireless-G technology, this router is backward compatible and will work seamlessly with them. To set up your network with the G54/N150, you need a Broadband Internet connection and a computer running Microsoft Windows XP 32 (SP3 or greater), Windows Vista (32/64), Windows 7 (32/64), Windows 8 (32/64), Windows 8.1 (32/64), or Mac OS X (v10.5 or above); an installed network interface card and TCP/IP networking protocol; Internet Explorer (v7 or above), Firefox, Google Chrome, or Safari; and a minimum of 512 MB RAM. *Twice the speed and other physical data rates are achievable only when used in combination with an N150 Wireless USB Adapter. **The standard transmission rates--150Mbps, 54Mbps, and 11Mbps--are the physical data rates. Actual data throughput will be lower.